The South, small towns, and racing grandstands are apart of the heritage of the "cotton mill man." Those of us born in the "city of looms" didn't have the privilege of the "silver spoon." Families struggled to make ends meet, and so did the family that lived on Sedan Street. TV and Hollywood were out of their small town reach, but that all changed because of "racing on the beach." A dad named Ralph and his son Dale had a passion for racecars and were "tuff as nails." The "fire in their bones," the dirt, the grime had them chasing a dream without owning dime. A mom named Martha fussed about "chores," but Dale was obsessed over horsepower, camber and cylinder bore. 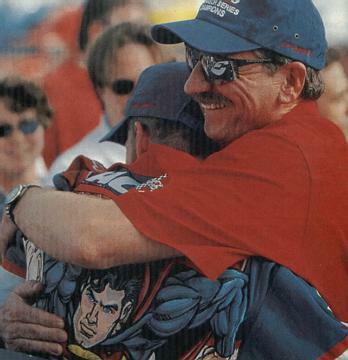 With his dad's spirit and his own guts and desire, the K-town boy would become a Winston Cup hire. Soon all would know of his talent and drive, and that Champion status would not be denied. His style of "rubbing is racing" and "banging on doors," created the stuff that is now folklore. 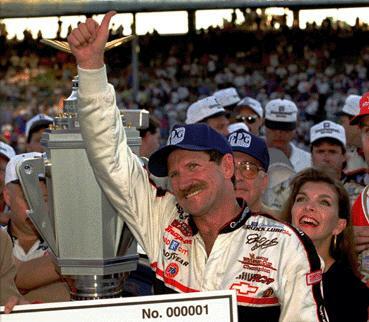 This hard-charging driver with the bushy mustache took Winston Cup Racing to the top so fast, that now our cities big and small have come to know the greatest races of all. This small town icon who made fortune and fame, lived up to his image and was "too tough to tame!" On weekends "cotton mill guys" would watch and yearn, but this past Sunday the worst we'd learn. 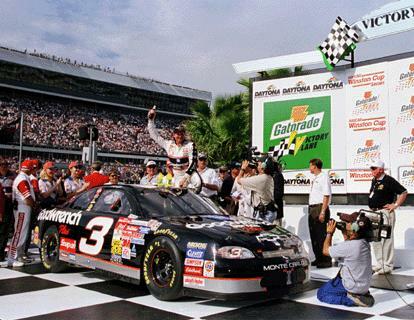 The "MAN IN BLACK" who defied wrecks and burns would never make it out of Daytona's fourth turn. 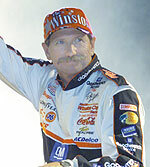 We'll all miss him for years it will seem, but we know God allowed DALE EARNHARDT to be the "poor man's dream." I looked at you and said, "This is what life is all about"
The hugs and the kisses, the sleepy "I love yous"
Each time we must face that there never will be. We watched our hero fall away. We held our breath, and just sat back. When out of no where came a bump. We watched our hero fall. His heart had beat it's last beat. Tears could have filled the oceans. The intimidator so loving and free. make Dale proud and keep reaching for the sky.